Bar shot was used at close range to slash through the rigging and sails of an enemy ship. The weight on either end of the bar would cause the whole thing to partially rotate after it was fired out of a cannon, inflicting maximum damage on sails and rigging. Such attacks could prove devastating, especially at sea, when a successful volley could force sailors to choose between starving whilst stranded at sea or surrendering to the pirate crew. Bar shot can be constructed in a variety of ways, but four distinct types have been recovered from Queen Anne’s Revenge thus far, both fragmented and complete. Bar shot with whole (cannon ball-shaped; top in photo above), half (hemi-spherical; middle in photo above), and hammer (cylindrical; bottom in photo above) heads are connected by a solid wrought iron bar, square in cross-section. 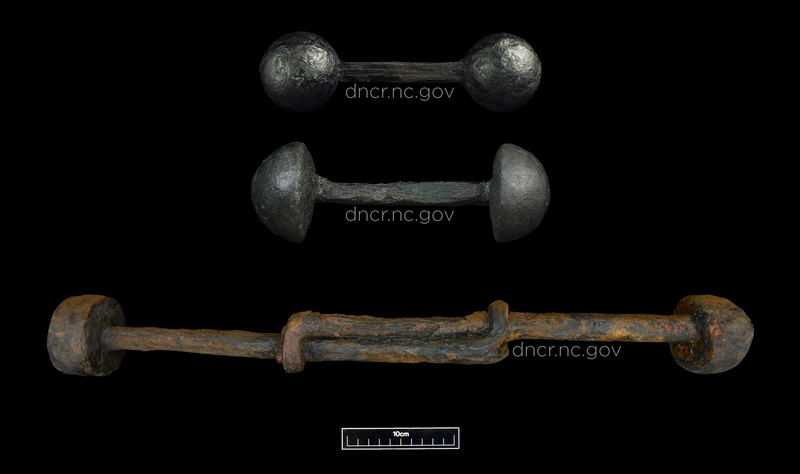 A recently cleaned expanding bar shot (bottom in photo above) consists of two linked bars with hammer heads on either end, which would be loaded collapsed into a cannon, but spread out to almost three feet when fired. In total, we have recovered over 35 complete and fragmented bar shot.